Autoantibodies to the M-type phospholipase A2 receptor (PLA2R) are sensitive and specific for idiopathic membranous nephropathy. The anti-B cell agent rituximab is a promising therapy for this disease, but biomarkers of early response to treatment currently do not exist. Here, we investigated whether levels of anti-PLA2R correlate with the immunological activity of membranous nephropathy, potentially exhibiting a more rapid response to treatment than clinical parameters such as proteinuria. We measured the amount of anti-PLA2R using Western blot immunoassay in serial serum samples from a total of 35 patients treated with rituximab for membranous nephropathy in two distinct cohorts. Pretreatment samples from 25 of 35 (71%) patients contained anti-PLA2R, and these autoantibodies declined or disappeared in 17 (68%) of these patients within 12 months after rituximab. Those who demonstrated this immunologic response fared better clinically: 59% and 88% attained complete or partial remission by 12 and 24 months, respectively, compared with 0% and 33% among those with persistent anti-PLA2R levels. Changes in antibody levels preceded changes in proteinuria. One subject who relapsed during follow-up had a concomitant return of anti-PLA2R. In summary, measuring anti-PLA2R levels by immunoassay may be a method to follow and predict response to treatment with rituximab in membranous nephropathy. Idiopathic membranous nephropathy (IMN) is an organ-specific autoimmune disease and a common cause of adult nephrotic syndrome worldwide. Its natural history follows three major clinical courses: spontaneous remission, stable but persistent proteinuria, or progression to ESRD. The necessity, timing, and choice of immunosuppressive therapy are not universally agreed upon. Straightforward treatment algorithms have been proposed1 that astutely recommend treatment of this disorder with immunosuppressive agents in situations of sustained heavy proteinuria or in the face of worsening renal function. Traditional regimens have included cyclophosphamide and cyclosporine in conjunction with corticosteroids, but all of these agents have significant toxicity. Rituximab, a chimeric anti-CD20 monoclonal antibody used for anti-B cell therapy, has recently been investigated as a promising agent for the treatment of membranous nephropathy (MN) in the native kidney and for recurrent MN in the allograft.2–7 Treatment response has been assessed by the attainment of a complete or partial clinical remission, whereas other laboratory parameters have not been useful in monitoring therapy. Our laboratory has recently identified the M-type phospholipase A2 receptor (PLA2R) as a major antigenic target in IMN,8 and we have demonstrated that autoantibodies reactive with this protein are sensitive and specific for the disease. We sought to determine in a cohort of patients with IMN treated with the immunosuppressive agent rituximab whether serial measurement of anti-PLA2R could be correlated with clinical response. Our hypothesis was that anti-PLA2R, as a potential marker of the immunological activity of IMN, might exhibit a different and more rapid response to treatment than clinical parameters such as proteinuria. There have been two recent trials of rituximab for the treatment of IMN. The first used a dosing regimen of two 1-g doses given 2 weeks apart5; these patients were followed for 12 months and revealed a 57% remission rate. The second study, using four weekly doses of rituximab given at 375 mg/m2, demonstrated an 89% response rate with 2 years of follow-up.4 Banked serum samples were available for all 35 subjects enrolled in these two trials and were tested for the presence and amount of anti-PLA2R autoantibodies. We tested the baseline sera from 35 patients with biopsy-proven IMN in the two treatment cohorts for the presence of autoantibodies reactive with PLA2R using serum diluted at 1:25 as described previously.8 At this serum dilution, 10 of 15 patients (67%) in cohort 1 and 15 of 20 patients (75%) in cohort 2 possessed anti-PLA2R reactivity in their baseline serum sample. Reactivity was confirmed against native PLA2R from human glomerular extract and cell-expressed recombinant human PLA2R. The strength of the PLA2R band on immunoblot was quantitated by densitometry; all baseline samples were assayed at 1:25 in the same experiment and are therefore directly comparable (Table 1). The successive levels of anti-PLA2R in all available serum samples after treatment with rituximab were then measured (see Concise Methods). Representative examples are shown in Figure 1. Most patients showed a progressive decrease in the level of anti-PLA2R after treatment with rituximab. We did not detect any difference between the two treatment regimens (2 × 1 g dosing versus 4 × 375 mg/m2 dosing) in terms of this progressive loss of antibody levels, although the second study had more sample collections within the second year of follow-up. Representative immunoblots demonstrate four patterns of response of IgG4 anti-PLA2R signal at sequential time points after rituximab treatment (0 to 30 months; all patients are missing data from one or more time points). Panel A depicts the typical reduction (through 6 months) and disappearance (9 months and beyond) of anti-PLA2R exhibited by most patients. Panel B shows a similar pattern (upper blot), but a longer exposure of the immunoblot (lower) demonstrates that the anti-PLA2R signal persists at a very weak, subthreshold value through the final time point (arrow). Panel C is representative of the six patients in which anti-PLA2R did not substantially decline after treatment. Panel D depicts the single patient whose anti-PLA2R returned with relapse of his disease after having initially disappeared. We categorized patients according to the presence or absence of detectable anti-PLA2R in the baseline serum sample, and if positive, whether or not these autoantibodies had disappeared by the 12-month time point (Table 1). We assigned 1000 units as the threshold for a positive reaction because below that level the bands were invisible to the naked eye. The 17 patients in group 1 were anti-PLA2R positive at baseline but had undetectable levels at 12 months. In contrast, the six patients in group 2 (also anti-PLA2R positive at baseline) remained anti-PLA2R positive at 12 months. An additional two patients (subjects 24 and 25) who also exhibited a minimal decline in autoantibody levels but lacked a 12-month sample are listed with group 2 in Table 1 but are not included in intergroup statistical analyses. The ten subjects that comprise group 3 did not have detectable anti-PLA2R autoantibodies in their baseline or subsequent samples and are considered anti-PLA2R negative. We compared 12- and 24-month clinical outcomes on the basis of group assignment with the hypothesis that evidence of an immunologic remission (clearance of anti-PLA2R by 12 months) would be predictive of a favorable response to treatment with rituximab. Group 1 had two complete remissions (CRs) and eight partial remissions (PRs) at 12 months, yielding a 59% response rate; at 24 months there were five CRs and ten PRs for an 88% response rate. One patient failed to reduce proteinuria to non-nephrotic levels by 24 months with no further clinical follow-up available. The final patient had reached 0.3 g/d of proteinuria at the 18-month time point but had relapsed with 5.3 g/d of protein at the final 24-month time point. Of note, the anti-PLA2R level was again positive at this time of relapse (see Figures 1 and 2). The clinical response to rituximab is temporally associated with the immunologic response. 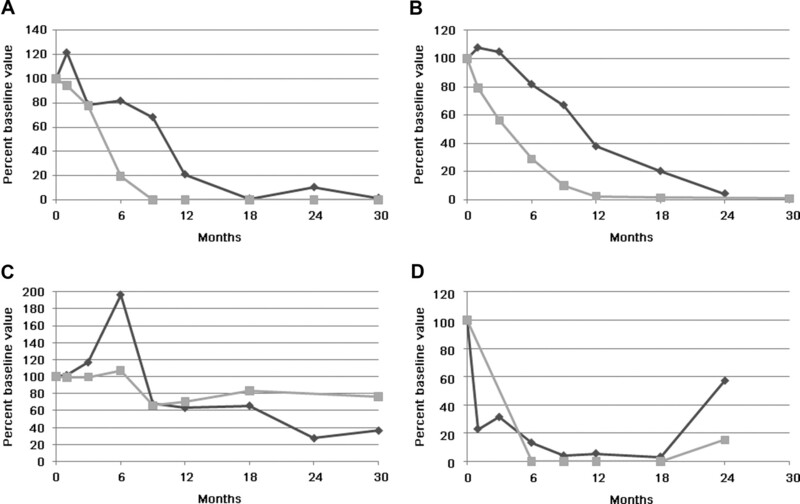 Representative plots of anti-PLA2R (gray squares) and proteinuria (black diamonds) versus time after initial rituximab treatment. Values are plotted as percent of baseline value for sake of better comparison between subjects. The four graphs correspond to the four immunoblots depicted above and to the following subjects in Table 1: A, subject 13; B, subject 6; C, subject 22; D, subject 9. In contrast, in the six patients with 12-month samples in group 2, there were no remissions by 12 months and only two PRs at 24 months (0% and 33% response rates, respectively). Because the study presented here investigates the predictive value of a rituximab-induced decline in anti-PLA2R, those subjects for whom it was felt clinically necessary to switch to another immunosuppressive agent were considered nonresponders, along with those who failed to achieve a proteinuric response and those who progressed to ESRD. Given these less favorable outcomes in group 2, we highlight the individual patient outcomes. One patient from the initial (2 × 1 g) rituximab treatment cohort completed the 12-month study as a nonresponder (NR) with 20.2-g/d proteinuria but progressed to ESRD. Two other patients also completed this study as NRs with 7.7- and 14.1-g/d proteinuria and required further treatment with alternative immunosuppressive agents. A fourth patient, who was discontinued from the second (4 × 375 mg/m2) rituximab treatment cohort after 12 months because of a failure to clinically respond, was also switched to another agent. Although these three patients ultimately achieved a reduction in proteinuria because of the additional therapy, these responses were censored for our analysis. The two PRs (in response to rituximab) in group 2 occurred in a patient whose anti-PLA2R level became undetectable by 18 months and another with persistently high autoantibody levels through 30 months. The differences in 12- and 24-month clinical outcome between groups 1 and 2 (Table 1) were statistically significant when analyzed according to any versus no remission (χ2 analysis P = 0.012 and P = 0.008 at 12 and 24 months, respectively) or CR versus PR versus NR (P = 0.044 and P = 0.024, respectively). Even among the subjects who had not responded at the 12-month time point (7 of 17 in group 1 and 6 of 6 in group 2), there was a trend toward intergroup differences. The mean 12-month proteinuria value was 6.7 g/d (median 6.0 g/d) among group 1 NRs but was 11.5 g/d (median 10.9 g/d) in group 2 (P = 0.068). Six of the seven group 1 NRs went on to achieve a 24-month PR with no additional treatment, as opposed to only two of the six group 2 NRs (P = 0.053). We next assessed how the immunologic changes in anti-PLA2R were related to the clinical reduction in proteinuria in response to rituximab. Representative examples, corresponding to the previously shown immunoblots, are depicted graphically in Figure 2. Remarkably, for those that showed decreases in anti-PLA2R, this decline in anti-PLA2R almost always preceded the decline in proteinuria by months. To demonstrate this point in a composite manner, we compared changes in anti-PLA2R levels and proteinuria for all 17 group 1 patients who had cleared their autoantibodies by 12 months in response to rituximab (Figure 3). A median anti-PLA2R level of 0 arbitrary densitometric units (range 0 to 4013 arbitrary densitometric units) was reached at 9 months, whereas the median proteinuria at this point was still 3.8 g/d (range 0.4 to 12.6 g/d) but continued to decline through 24 months. Anti-PLA2R (left box plot) declines in advance of a more gradual decline of proteinuria (right) in those patients who cleared anti-PLA2R. Boxes represent median (line) and 25th and 75th percentiles, with whiskers to the 10th and 90th percentiles. Outliers are represented by filled circles. Similarly, the median time after initial treatment with rituximab to the point at which anti-PLA2R reached an undetectable level was 9 months (range 1 to 18 months) in the 18 patients (17 in group 1 and a single patient in group 2) who ultimately cleared anti-PLA2R. The time in months to reach an undetectable anti-PLA2R level showed a trend toward a positive correlation with 12-month (Spearman rank order r = 0.458, P = 0.055) and 24-months proteinuria (r = 0.461, P = 0.061). Mean proteinuria at the time when anti-PLA2R first disappeared was 3.1 ± 2.8 g/d (median 2.4 g/d, range 0 to 10.7 g/d) and continued to decrease at their next time point to 2.0 ± 2.2 g/d (median 1.1 g/d, range 0.1 to 7.2 g/d). This differed significantly from the 9-month proteinuria values for the remaining five subjects in group 2 (mean 11.0 ± 5.0 g/d; median 8.1 g/d, range 6.7 to 17.4 g/d; P = 0.010). In contrast to the former group, proteinuria at the subsequent (12-month) time point did not decrease (mean 12.5 ± 5.6 g/d; median 14.1 g/d, range 6.2 to 20.2 g/d). There was no statistically significant difference in baseline proteinuria between groups 1 and 2 (Table 1). The individual responses of proteinuria to treatment with rituximab are shown graphically as log plots in Supplemental Figure 1. To determine if anti-PLA2R levels at time points earlier than 12 months might also be associated with clinical outcome, we correlated autoantibody levels at all available time points with baseline, 12-months, and 24-month proteinuria in all anti-PLA2R-positive subjects (Supplementary Table 1). There were significant positive correlations of the 12-month proteinuria with anti-PLA2R (the actual level or expressed as a percentage of baseline level) at 1, 3, 6, and 12 months, with the highest correlation coefficient (r = 0.821) at 3 months. These same factors were not significantly correlated with 24-month proteinuria data, most likely because of reduced numbers of subjects due to the treatment failures and dropouts in group 2. The slope of log10-transformed anti-PLA2R levels over the first 6 months of follow-up also significantly correlated with 12-month (r = 0.694, P = 0.0001) and 24-month proteinuria (r = 0.528, P = 0.02). Additional details are provided for the patients that did not demonstrate baseline reactivity for anti-PLA2R (group 3 in Table 1; Supplementary Table 2). There were no statistically significant differences among baseline characteristics for the 25 individuals positive for anti-PLA2R compared with those of the 10 who were negative (Supplementary Table 2). There were also no differences in clinical outcome between group 3 and the combined anti-PLA2R-positive groups. There were four CRs and three PRs at 24 months (78% response rate), as well as two NRs (one of whom completed the 12-month study with 19.9-g/d proteinuria and progressed to ESRD). The tenth patient was censored from the follow-up analysis because he died before the 6-month time point; his death was unrelated to his treatment or his underlying MN. To assess whether any of these apparently autoantibody-negative group 3 subjects actually had very low baseline titers of anti-PLA2R (undetectable at a 1:25 dilution of serum), we repeated the Western blot assay using a 1:10 dilution of serum. Two additional patients (subjects 26 and 27 in Table 1) demonstrated anti-PLA2R positivity at this low titer. We have previously shown that most patients with IMN have circulating antibodies reactive with the M-type PLA2R, a podocyte protein that is likely to be the target antigen in this disease.8 This study extends our initial observations and suggests that changes in the level of anti-PLA2R are associated with and, more importantly, precede corresponding changes in the clinical activity of the disease. This incomplete mirroring of immunological improvement by proteinuria status is clinically very relevant. As described above, proteinuria could remain at subnephrotic levels despite an absence of immunological disease activity. In this situation, further immunosuppression would not be necessary and potentially harmful, and management should only be conservative. Alternatively, the persistent proteinuria could be due to ongoing immunological disease (as detected by the persistence of circulating anti-PLA2R), and continued, increased, or altered immunosuppressive therapy should be considered. How might we apply the results of the study presented here for monitoring patients in the clinical setting? The disappearance or decline in anti-PLA2R up to and including 12 months was associated with a favorable clinical response and may imply that immunosuppression could be modified or discontinued before the current standard of a reduction in proteinuria. Perhaps more relevant are those patients without a significant decline in antibody levels and no subsequent proteinuria reduction after rituximab treatment. This finding, if confirmed, could result in earlier discontinuation of this treatment, reducing exposure to a potent, potentially toxic, and expensive immunosuppressive agent and potentially introducing an alternative, more effective agent. It is likely that two patients in group 3 (“anti-PLA2R negative”) had low titers of anti-PLA2R that were below the detection threshold in their baseline samples when assayed at 1:25. We speculate that, despite a rigorous definition of IMN and the requirement for stable nephrotic levels of proteinuria between 4 months before the start of the trial and baseline, at least one of these patients may have been entering a remission before initiation of rituximab. This patient (subject 26 in Table 1) had proteinuria of 6.4 g/d at the −4 month time point that decreased to 5.7 g/d at baseline and quickly fell to 2.0 g/d at 1 month after treatment. Given that this subject's baseline anti-PLA2R was only detectable at a titer of 1:10 and quickly disappeared thereafter, it is possible that the immunologic disease activity was remitting before the start of the study. It may be important for future trials to consider enrolling a homogeneous cohort of anti-PLA2R-positive patients that not only have stable proteinuria but also stable levels of autoantibody. Furthermore, given that participants who ultimately achieve PR defined only by proteinuria may or may not have residual immunological disease, anti-PLA2R levels may one day become an important independent treatment outcome. Anti-PLA2R antibodies could not be detected in 8 of the 35 patients at baseline even at a 1:10 dilution. There were no statistical differences in those with and without anti-PLA2R in terms of clinical remission. Because all patients were severely nephrotic at the outset, it is highly unlikely that all of these negative patients were once anti-PLA2R positive but had entered immunologic remission by study onset (as described above). We instead speculate that the anti-PLA2R-negative patients might have circulating pathogenic antibodies to an antigen other than PLA2R. Autoantibodies to additional human podocyte (neo)antigens have recently been implicated in IMN,15,16 and it is likely that other relevant antigens have yet to be identified. It is thus important to recognize that a negative test for anti-PLA2R should not be regarded as a contraindication to treatment with rituximab or other immunosuppressive agents given the similar clinical response rates demonstrated for the anti-PLA2R-positive and anti-PLA2R-negative cohorts. Research in this field should continue to focus on the identification of additional antigens and markers of immunological activity in this smaller subgroup of anti-PLA2R-negative IMN patients. The foremost limitation of this study is that, because of the study design of the first rituximab treatment cohort, serum samples were not routinely collected beyond the 12-month time point, limiting our major analyses to samples collected in the first year and leaving open the question of whether any of the group 2 patients might also have progressed to an immunological remission. Although this data series was analyzed retrospectively, it is important to recognize the clinical data were blinded until after the assays were performed, limiting any potential bias. Future trials using different therapeutic agents should incorporate the assay and validate these observations. Measurement of anti-PLA2R antibody levels, if the above utility is confirmed, will influence predictive algorithms and future treatment protocols and improve the care of patients with IMN. The serial serum samples for this study were collected prospectively for the analysis of two dosing protocols that involved the use of the anti-B cell agent rituximab for the treatment of IMN. In study 1,5 15 patients with IMN were treated with two doses of 1 g of rituximab given 15 days apart; this treatment could be repeated at 6 months if indicated. In the second study,4 20 patients with IMN were treated with four weekly doses of rituximab given at 375 mg/m2. This treatment was repeated at 6 months. Serum was routinely collected at baseline, 1, 3, 6, 9, 12 months and additionally in study 2 at 18, 24, and 30 months. Serum was stored at −80°C before use. Baseline samples were tested for the presence of anti-PLA2R antibodies by Western blot immunoassay against native PLA2R (present in extracts from human glomeruli) and cell-expressed recombinant human PLA2R, as described previously.8 The assessors of the assay were blinded to the clinical results. Subsequent sera from patients initially found to be positive in both assays were tested only against native PLA2R. Sera were routinely tested at a titer of 1:25, which has been shown to be sensitive and specific. All samples that were initially negative at 1:25 were retested at a serum dilution of 1:10 to detect very low titers of anti-PLA2R. Normal human sera or sera from patients with other forms of glomerular disease were negative for anti-PLA2R at 1:10. To standardize the assay for comparison of anti-PLA2R levels between different subjects, baseline samples from all 35 subjects were run in a single assay (primary assay). Identical lanes containing 30 μl of a single large batch preparation of human glomerular extract were electrophoresed by SDS-PAGE and transferred to nitrocellulose membranes. Individual lanes were cut and incubated overnight at 4°C with serial serum samples; all samples from an individual patient were processed in parallel. IgG subclass-specific sheep anti-human IgG4 (The Binding Site) was used at 1:3000 and ultimately detected with peroxidase-conjugated donkey anti-sheep IgG (Jackson ImmunoResearch), followed by reaction in a chemiluminescent substrate and a 10-second exposure to autoradiography film. Bands were quantitated using a Hewlett Packard scanner, aligned in Adobe PhotoShop CS4, and densitometry was performed using NIH ImageJ software. Anti-PLA2R values as determined by densitometry have been shown to be positively associated with anti-PLA2R titer in separate experiments (data not shown). Subsequently, and separately for each individual patient, available samples were assayed (secondary assay) and normalized according to the initial baseline value in the primary assay. We were able to compare anti-PLA2R values between subjects and between samples from each subject at all time points in this manner. Comparisons between groups were made using SigmaPlot version 11.0 (Systat Software, Inc.), t tests were used for normally distributed data, and Mann–Whitney U rank test was used for nonparametric data. Plots relating anti-PLA2R densitometric units to proteinuria values at each time point were created for each patient. Clinical end points were defined as per the therapeutic trials with the following definitions: CR, proteinuria < 0.3 g/d; PR, proteinuria ≤ 3.5 g/d and a >50% reduction from baseline proteinuria; limited response, a >50% reduction from baseline proteinuria but not achieving ≤3.5 g/d proteinuria; NR, <50% reduction from baseline proteinuria. For the statistical analysis of the 24-month clinical outcomes, progression to ESRD and the need to switch to another immunosuppressive agent (because of a clinical ineffectiveness of rituximab) were also considered as NRs. L.H.B. and D.J.S. are co-inventors on the patent application “Diagnostics for Membranous Nephropathy” and have received research support and consulting fees from Questcor Pharmaceuticals, Inc. This work was supported by a Career Development Grant from the Halpin Foundation–American Society of Nephrology (L.H.B. ), grant DK30932 from the National Institute of Diabetes and Digestive and Kidney Diseases/National Institutes of Health (D.J.S. ), by the Fulk Family Foundation, and by a UL1-RR24150 grant to the Center for Translational Science Activities at Mayo Clinic. We thank Dr. Gérard Lambeau from the Institut de Pharmacologie Cellulaire et Moléculaire, Centre Nationale de la Recherche Scientifique in France for providing the human PLA2R cDNA used in this study. Part of this material was presented in abstract form at the annual meeting of the American Society of Nephrology; October 27 through November 1, 2009; San Diego, CA. L.H.B. and F.C.F. contributed equally to this work. See related editorial, “Circulating Anti-PLA2R Autoantibodies to Monitor Immunological Activity in Membranous Nephropathy,” on pages 1400–1402. Is Long-Term Prediction in Membranous Nephropathy (MGN) Better Than the Weatherman's Forecast Capacity?